As a designers we fully appreciate the many influences which bombard our world each day. Some objects we intentionally ogle and evolve while other cues enter our sub-conscience through the osmosis of life. And then there are the collective thoughts of the world that seemingly populate independently. We can’t say for certain what the case was here. However; we would like to think that the McDonald’s development team stopped at the newly designed Magic Wok for a spring roll en-route to the Oak Brook Headquarters, and left with a distinct impression. 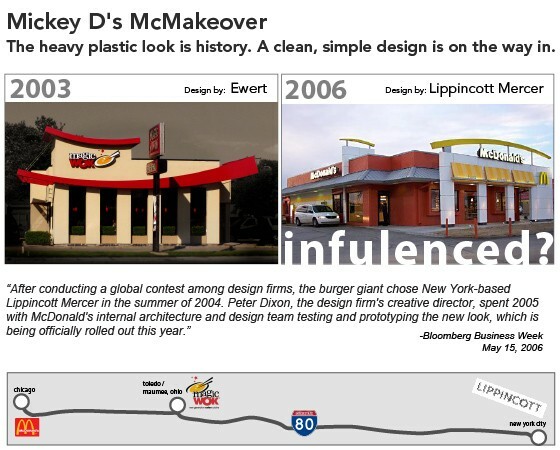 Later, this impression became the genesis for the new corporate architecture of the world’s largest restaurant chain. Tell us what you think!? Leave a comment! Amazing story!! Did you ever follow up with the NY company? ← Look what Google Found!